The Fed is clearly well out in front in reducing monetary policy stimulus. Its stance was demonstrated again in June as the FOMC (Federal Open Market Committee) increased the Federal Funds Rate by 25bp. As a result, the target rate rose to 1.00- 1.25%, while the Committee noted that the “labor market has continued to strengthen and that economic activity has been rising moderately so far this year”. Economists remain of the view that there will be one more rate hike this year, based on the data flow, particularly growth and solid labour market performance. The improved growth will come despite what are now increasing concerns, from economists and the Fed alike, that the softer pace of inflation may persist. Across the border the Bank of Canada (BoC) raised interest rates for the first time in seven years (September 2010) this month. The hike was in line with market expectations and saw the policy rate rise 25bp to 0.75%, in what was described as a “removal of stimulus”. The move was driven by the BoC’s confidence in its outlook for “above potential growth” for at least the remainder of 2017 and into 2018. Although equally it recognised the softness of inflation recently as it remains in the bottom of the target range. Yet this has been attributed to temporary factors and Governor Stephen Poloz noted that it takes 18 to 24 months for a monetary policy action to have its full effect on inflation. Poloz added that central banks must “target future inflation by anticipating future deviations from target”. Central bankers in Australia and New Zealand will be keenly examining the impact of Canada’s hike. Not only on its booming property market, but, as the BoC statement notes, the economy may be “more sensitive to higher interest rates than in the past, given the accumulation of household debt. We will need to gauge carefully the effects of higher interest rates on the economy.” Exactly the same can be said for household sectors in Australia and New Zealand. Across the Atlantic, the BoE is seemingly in two minds about whether or not to raise policy rates. The Monetary Policy Committee (MPC) was divided at its June meeting, voting by a majority of 5-3 to maintain its policy rate at 0.25%. The three members of the MPC in favour of raising rates included, as it transpired, the BoE’s Chief Economist – putting him somewhat at odds with a more measured view from Governor Mark Carney. Andrew Haladine’s and others more hawkish tone came as inflation becomes an increasing concern, with the MPC’s minutes noting it could rise above 3% by the autumn, “and is likely to remain above the target for an extended period” as sterling’s depreciation continues. The Bank of Japan is the laggard of the major central banks, displaying no current desire to relax its policy of accommodation. Governor Haruhiko Kuroda refused to be drawn recently on any specific discussion of an exit strategy, and its policy stance will therefore remain unchanged. 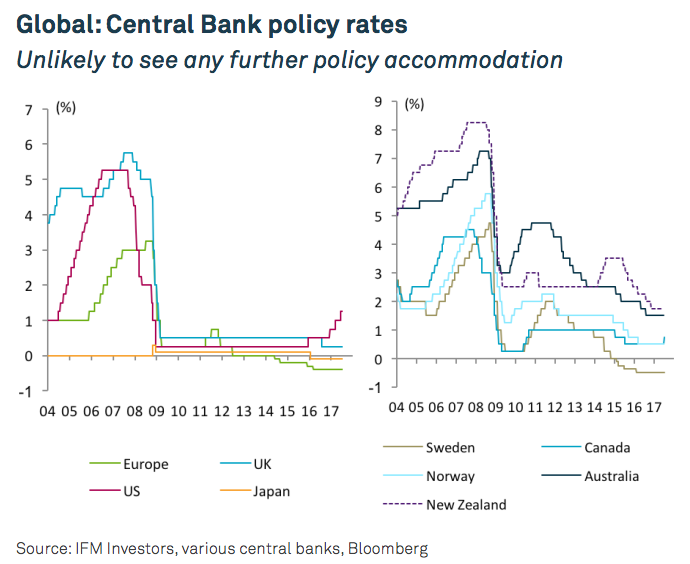 Negative interest rates and its ongoing commitment to keep the 10-year bond rate at 0% will remain for the foreseeable future (despite some speculation that this target may rise in line with global yields). This is as GDP growth is around potential, but the inflation pulse is unambiguously weak. As such policy will likely continue to be set “with a view to maintaining the momentum toward achieving the price stability target”. "if the RBA’s forecast were to come to pass then eight 0.25 percentage point tightenings over the course of 2018 and 2019 were “distinctly possible"
For the full IFM Investors June Economic update, please click here.